EliminInk is a cutting-edge tattoo remover. EliminInk is implanted into tissue the same way tattoo inks and permanent makeup pigments are implanted in tissue using a tattoo or permanent make-up machine. Regulations regarding who can treat clients for tattoo removal with EliminInk vary depending on Country, State, County, and in some cases City code. EliminInk can be utilized on both professional and home-made tattoos as well as permanent make-up on most areas of the body. The only treatment area that must be avoided is tattoos on the eyelid (i.e., eyeliner) or in the mouth. The treatment is not color selective (unlike laser) and is effective on all color inks and pigments. 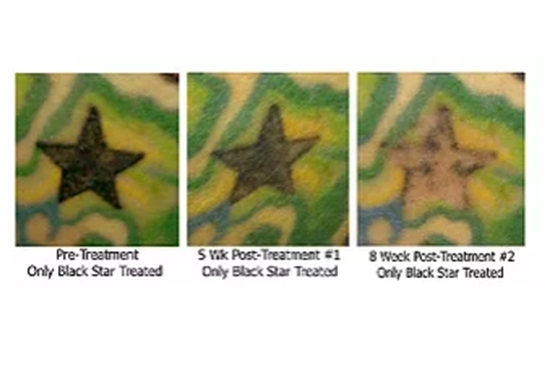 Through a specially-formulated process, EliminInk bonds with ALL permanent makeup pigments and tattoo inks resulting in a tattoo removal procedure that is NON-color dependent unlike that of laser which is color dependent. This, in turn, greatly increases the potential for successful tattoo removal and decreases the overall number of treatment sessions required (as compared to what is frequently required when using the laser technique). The EliminInk Tattoo Removal System is similar to the original tattoo procedure. The EliminInk solution is applied using a tattoo over procedure. Instead of implanting ink or pigment, EliminInks specially-formulated solution bonds with the original tattoo and then draws the ink to the skin’s surface. The treatment is very similar to being tattooed. Most clinics can apply topical anesthetic to numb the skin prior to treatment (if required). Results will vary depending on each patient.